When we need a quick treat, this is our best go-to-recipe. It's easy, fast and super delicious! Preheat oven to 325°F. Mix egg, peanut butter and sugar until well blended. 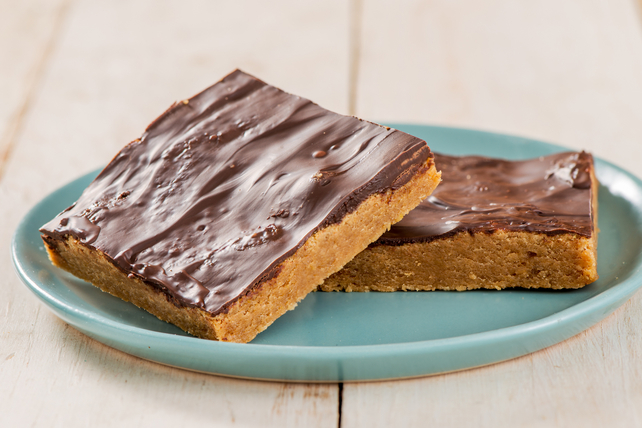 Spread into 8-inch square baking pan; sprinkle with chocolate. Bake 20 min. Cool completely before cutting into squares to serve. After squares are completely cooled, place in airtight container or freezer-weight resealable plastic bag and freeze up to 1 month. Thaw at room temperature before serving. When baking in glass baking dish instead of a metal pan, reduce the oven temperature by 25ºF. This is necessary since glass conducts and retains heat better than metal does.